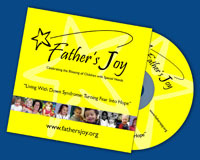 "Living with Down Syndrome:Turning Fear Into Hope"
GHFEDS hopes to get the message contained in this DVD out to everyone who could benefit from hearing it and are glad to distribute this DVD at no charge. If you are able to make a donation to assist us with continuing to reproduce and distribute these DVDs, please click here (suggested donation of $5 per DVD). Comments/What will this DVD be used for?